When Tracy and I learned that a highly rated Italian restaurant in Santa Monica served pasta in giant wheels of cheese, we decided Forma was a place we had to try! While in NYC last autumn, we dined at Cacio e Pepe (dinner order foreshadowing) that served its signature dish in a similar fashion, so we definitely wanted to check out this restaurant. The only reservation we could secure for Labor Day weekend was at 5 p.m. on Sunday. We arrived a little early, which was fortuitous as we had to drive around the neighborhood to find a place to park. At 5 p.m the restaurant was fairly empty, but it quickly filled to full capacity while we dined. Upon leaving, we noticed valet parking was also now available. We were seated at a booth along the far wall, so we could check out all the action. 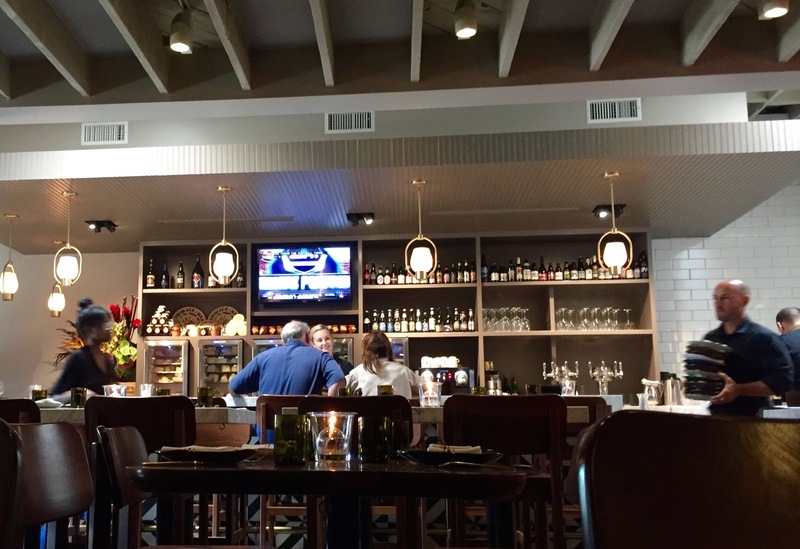 Decorated in modern, neutral colors, the restaurant is set up with the bar on one side and seating on the other… it was surprisingly spacious in such a small space. Even though the restaurant was completely full when we left, we didn’t feel as if we were sitting too close to the next table. But the best thing was that it wasn’t noisy and you could have a conversation with your dining companions. 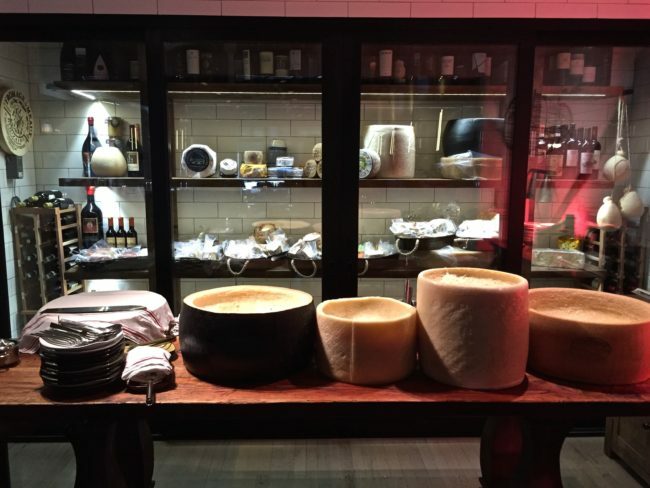 The vast array of cheeses (I’m sure you couldn’t Edam all) were on display behind the bar in chillers, and the big wheels of cheese were at one end of the dining room where we could watch our pasta dishes being prepared. 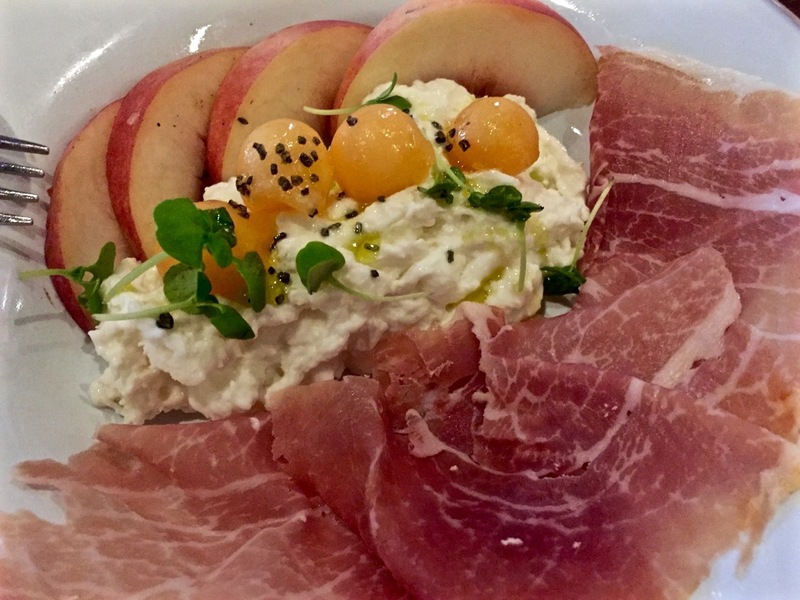 To start, Tracy and Susan shared appetizers of Crispy Artichokes; baby artichokes, mache, fennel, snow peas, walnuts, goat cheddar, ($12), and the Burrata Stracciata (which sounds like a classical piece of music); creamy burrata “culatello” prosciutto, white peaches and sweet melon ($16). I was there to help scoop up what they were unable to finish. They loved the crispy artichokes best, while I loved the Burrata Stracciata. 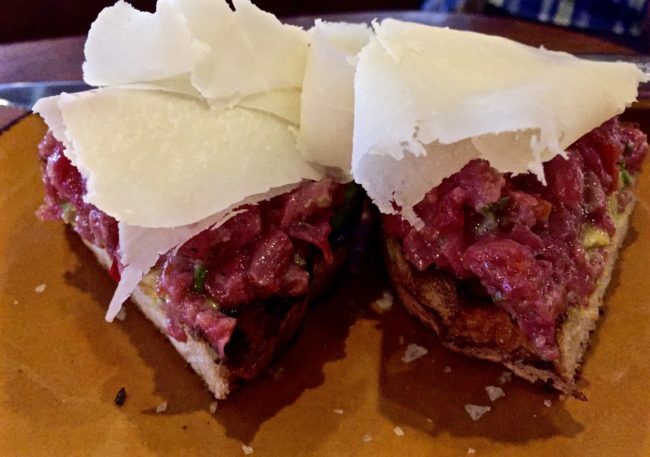 Speaking of love… the Filet Mignon Tartare; avocado, Fresno chile pepper, capers, shallot, parmigiana on grilled bread ($16), was out of this world. 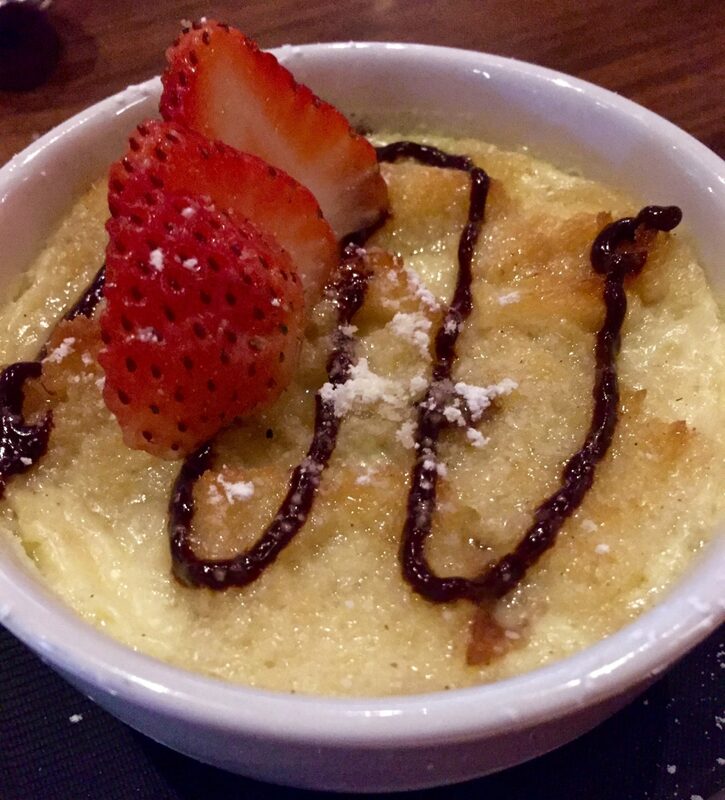 This was a definite “Wow” dish, and it took all my generosity to share even a tiny taste of this appetizer. It ranks as one of my favorite appetizers…ever! 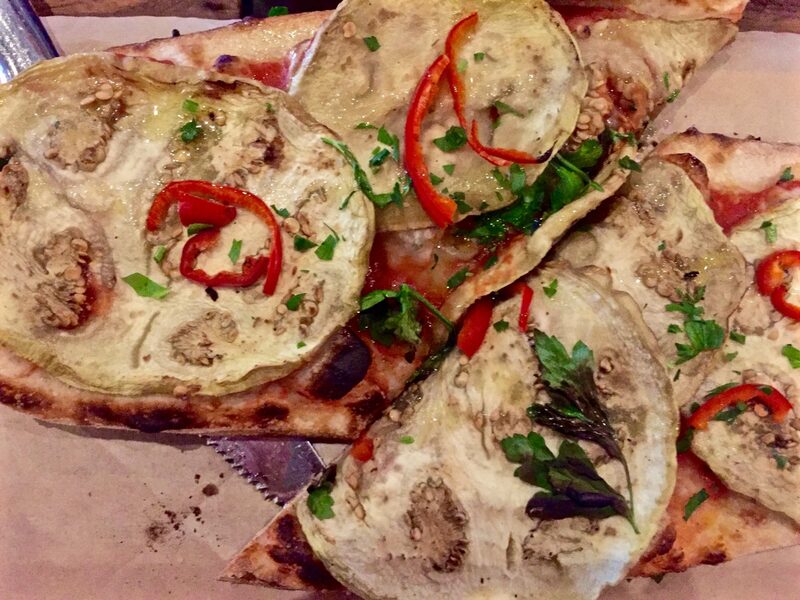 Tracy and Susan also shared a Sicilian Flatbread topped with eggplant, olives, capers, Fresno chilies and San Marzano tomato sauce ($10). 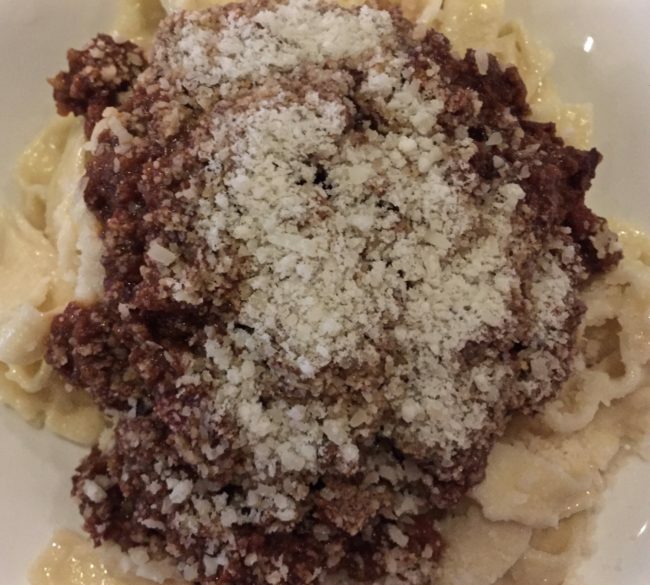 Although we were seriously tempted by the short ribs (8 hours, slow cooked boneless beef short ribs + short ribs ravioli for $32), Susan and I opted for the Cacio e Pepe (black pepper, extra virgin olive oil – tossed in Pecorino Romano cheese; $22). 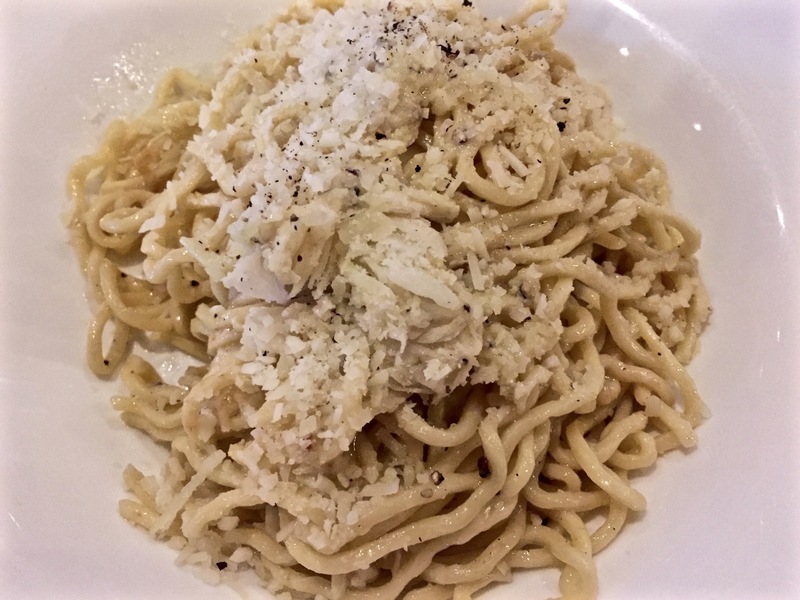 I am a Cacio e Pepe addict, and this extra cheesy dish more than satisfied my pasta craving. I would say that it was my Cheese Wheel of Fortune. 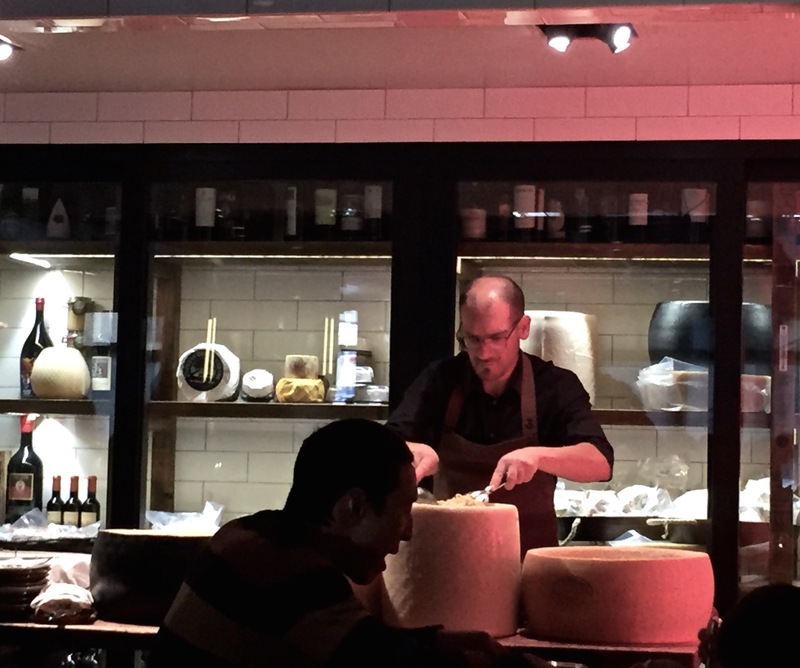 Although not served table-side in the cheese wheel like in NY, we could see the chef grating the cheese and tossing the pasta dishes in the giant cheese wheels located in the corner of the dining room (yes, he was “wheeling and dealing”). Someone whom I assumed might be the executive chef (well, he looked like The Big Cheese anyway) would occasionally pop his head out. For her main course, Tracy decided upon the Fettuccine Bolognese (beef ragu tossed with butter in Parmigiano Reggiano cheese; $25). Tracy was slightly disappointed in the Bolognese sauce, but in hindsight, since we were in a restaurant surrounded by cheese, she probably should have ordered a pasta in a cheese sauce. The family at the table next to us ordered the cheeseburger, which looked terrific; house ground rib eye steak, Raclette, avocado, arugula, aioli mustard, fries ($16). Tracy said it would be bad form to ask them for a bite…but I was tempted. 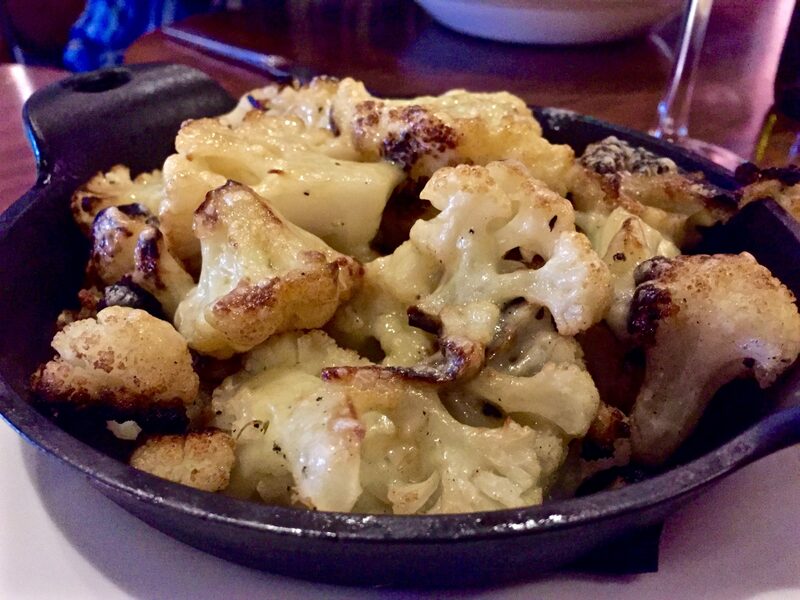 To round out our 5-A-Day and since we are all big cauliflower fans, the roasted cauliflower topped with melted Raclette cheese ($9) caught our eye. This was served in a mini cast iron skillet, but was a little light on the cheese, which made it slightly bland. I liked it more than the ladies. 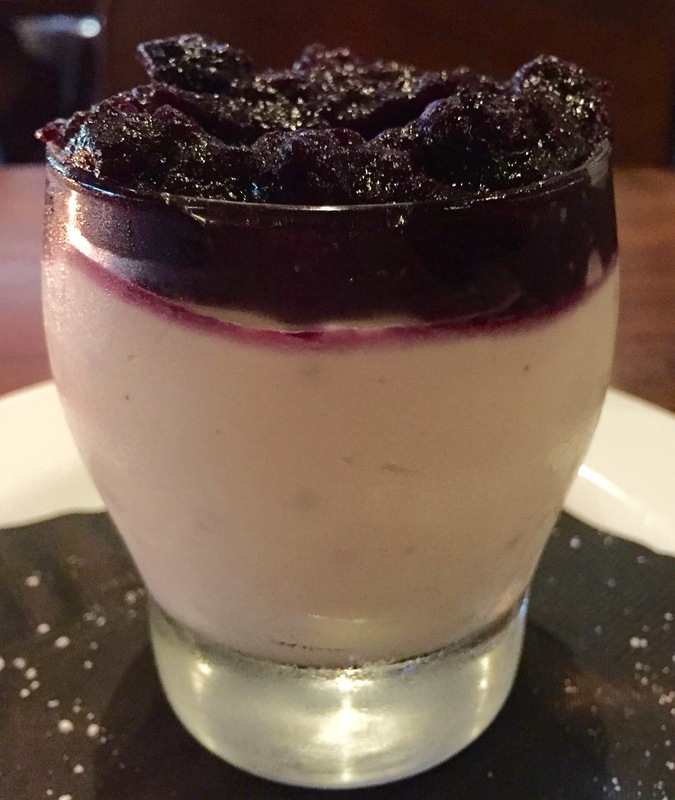 Not deterred by consuming a plethora of delectable calories, for dessert the three of us shared the “Wow” Nutella Bread Pudding ($9) and the scrumptious Chia Vanilla Petit Pot (fortunately grass does not grow on this Chia) with blueberry preserve ($8). There are a few other items available, including a flight of three blue cheeses paired with dessert wines ($18). Forma provides an extensive wine list (by the bottle or by the glass) and beer selection (no cocktails). I enjoyed my glass of Super Tuscan vino. 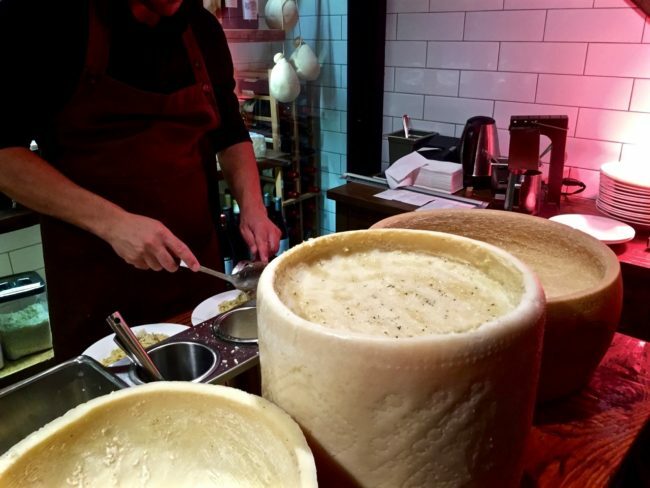 In addition, one could spend quite a bit of time perusing Forma’s humongous cheese menu. Check out all those formaggio selections that sit in the ‘fridge behind the cheese bar area…some 70 or so to choose from (Truffled, Semi-Hard, Hard, Blue-Veined, Soft…well, you get the idea… a lot). For the most part, we were quite happy with our entire experience at Forma (which I suppose would make us pro Forma). 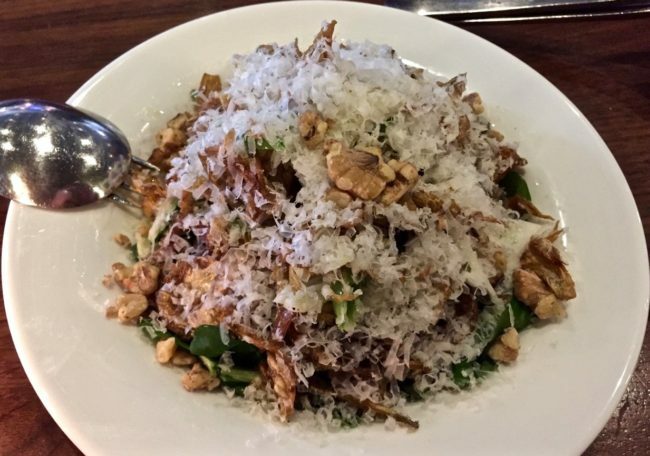 We don’t venture to Santa Monica too often (traffic can ruin my appetite), however I would definitely return if we had some friends who wanted to make the trek to Santa Monica with us (I can still taste that Cacio e Pepe and Filet Mignon Tartare…Molto Bene!). For those of you visiting the Santa Monica area, I would certainly recommend making a reservation in advance for dinner at Forma. Cheeseheads unite! Hours: Sunday – Thursday 11 a.m. – 10 p.m. • Friday/Saturday 10 a.m. – 10:30 p.m.